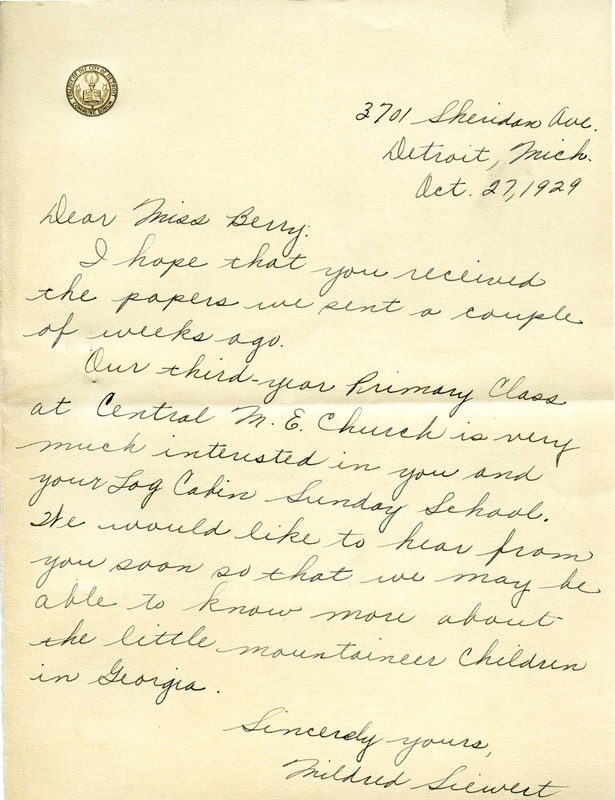 Mildred Siewert writes to see whether or not Miss Berry received the Sunday School papers her third-year primary class sent and to ask Miss Berry to write soon so that they may learn more about the "little mountaineer children in Georgia." Mildred Siewert, “Letter to Martha Berry from Mildred Siewert.” Martha Berry Digital Archive. Eds. Schlitz, Stephanie A., Chelsea Risley, et al. Mount Berry: Berry College, 2012. accessed April 22, 2019, https://mbda.berry.edu/items/show/10984.